If you'd rather not park in a remote garage or lot, this article will point you in the right direction. ABOVE: The three-star Hotel Cris in Mestre has a locked parking area behind the building. 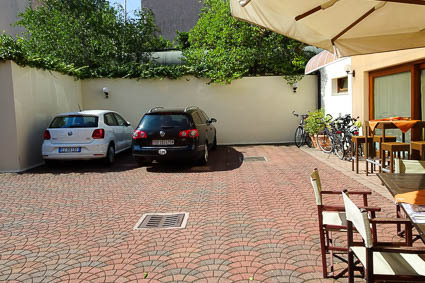 Parking is free for guests. Take a No. 17 car ferry to Venice's island beach resort, the Lido di Venezia, where cars are allowed and many hotels offer parking. (From the Lido, you can easily catch a vaporetto or water bus into the historic center of Venice. If you're annoyed by parking fees, look for the words "free parking" in our hotel descriptions. Links from our hotel descriptions will take you to the hotels' pages on our partner site, Booking.com. Booking.com is Europe's leading secure reservations service, with guaranteed lowest available rates and free cancellation unless otherwise indicated.